Hard to believe but true- the industrial production of the lovable VW Bug was partially the brainchild of none other than Adolf Hitler. While most of us, when we think of Hitler and the Nazis remember the six million Jews and many, many others killed during the Holocaust, we generally forget that the Nazis were a socialist party committed to improving the lives of (Aryan) workers. The Volkswagen, as the “people’s car,” was seen as one key step in making Germany a workers’ utopia. With its roots in militant, racist nationalism, the National Socialist German Workers (Nazi) Party arose from the political and economic instability suffered by Germans in the early 1920s. The hyperinflation, poor wages and unemployment that marked Germany’s infamous Weimar Republic were caused in large part by war reparations and other Draconian measures demanded by the victors of World War I in the Treaty of Versailles. Although the German economy enjoyed a period of stability through the mid-1920s, it crashed hard in late 1929 partially as a result of the American stock market crash of that same year. In response, the government adopted strict austerity measures to control inflation including reducing benefits for the unemployed, sick and aging. By 1931, the government’s policies had driven down the price of goods, which led to further reductions in wages and jobs. By 1932, this downward spiral had driven Germany’s workers to the socialist parties that catered to them, including the Nazis. In the elections of that year, the Nazis gained a number of seats to hold a powerful position in the Reichstag (Germany’s legislature); under pressure, Germany’s president appointed Hitler, the leader of the Nazi party, as Chancellor of Germany in 1933. Preaching to the choir, the Nazis evangelized the evils of capitalism and the rights of workers. Party members believed that the nation’s economic woes were the fault of greedy capitalists and, above all, wealthy Jewish financiers who held much of Germany’s debt. To redress the problem, the Nazis proposed a number of measures to improve workers’ lives; known as the Twenty-Five Points, the proposals included the nationalization of industry, benefits for the elderly, land reform, public education reform, an end to child labor, the creation and fostering of a middle class, and the end of high interest money lending, otherwise known as usury. (Of course, a number of the reforms were geared toward disenfranchising the Jews and other “inferior” races, but that’s a subject for a different article). Once the Nazis had political power, some of the 25 points began to be put into effect through practical programs. The production of the Volkswagen was one of them. In the 1920s, a number of European carmakers were looking at creating smaller, more affordable cars for average, working class families. One of these, Ferdinand Porsche, designed and built a prototype he named the Volksauto, a predecessor to the Volkswagen. The Nazis saw the value in equipping the average German family with a car that sat five, could reach respectable speeds and was still affordable for working-class Germans. After being appointed Chancellor, Hitler adopted Porsche’s design for his “people’s car.” Because private industry could not produce the car at the low price Hitler envisioned, he had a factory built to make the cars in 1938. To help workers afford the modest price, a government-sponsored savings program was also administered. Unfortunately, war broke out (or perhaps more accurately was waged), and the state-owned plant stopped making the people’s cars and switched to producing military vehicles. Just before the war, Porsche was having trouble with the fact that his new people’s car violated quite a lot of patents from the Czechoslovakian car company Tatra, who’d built a very similar car already. Porsche agreed to pay Tatra a settlement for the infringements, but Hitler intervened and told Porsche he’d “solve his problem” for him. Needless to say, Tatra wasn’t happy about not getting paid, but this ultimately was a moot point as Germany shortly thereafter invaded Czechoslovakia and took over management of Tatra and its factory. Eventually Volkswagen did finally settle out of court with Tatra in 1961 for the patent violations. After the war, the factory eventually went back to making cars and production soon ramped up. 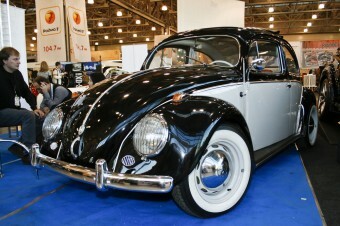 Volkswagen’s iconic former “people’s car” or as it was actually called- the Type 1 (the official name for the Beetle)- quickly became a favorite in North America, and by 1972, over 15 million had been sold. By the time the last Love Bug was taken off the line in 2003, over 21 million of these efficient and relatively inexpensive beetles had been produced. A Nazi rocket scientist, Werner von Braun, invented the first long-range ballistic missile – the V2. First launched in battle in 1944, it was used approximately 3000 times during World War II. After the war, von Braun was brought to the United States. He went on to direct the Marshall Space Flight Center and lead the team that created the Saturn V rockets which propelled America’s Apollo missions. When the V2’s first started striking Britain, the government initially tried to cover it up, stating that the explosions were caused by gas main leaks. This resulted in the public mockingly calling the rockets “flying gas pipes”. The V2’s weren’t nearly as devastating as they could have been as British intelligence managed to convince the Germans that the rockets were missing London by about 20 miles, rather than hitting it, as they were. As a result, many of the V2’s launched were recalibrated to correct for this “error”. After that, most of the rockets missed London completely. The Nazi’s had a prototype for a stealth fighter that, if flown only a few feet above the English Channel, would have been invisible to the British. Luckily, the Horten 2-29 was not put into production prior to VE Day on May 8, 1945. During World War II, allied fighter pilots frequently observed glowing balls of moving fire while on combat missions over Europe. Named foo fighters, there are a number of theories on the source of the fireballs, including UFOs and ball lightning. One explanation is that they were the air equivalent of land mines, launched into the skies by the Nazis to disrupt the pilots’ plans and even interfere with the planes electronics. Thousands (about 3 thousand) of V2s were launched at London and Antwerpen, Belgium. This makes the V2 by far the MOST used long-range ballistic missile ever built. Check your facts!!! @webpa: Thanks for catching that. Fixed! Your article really skips over a lot of what distances VW from it’s Nazi ties. The concept of a “Volkswagen” predates the Nazi party by decades, and the final design was a direct descendant (or ripoff) of prior models, as you mentioned. The factory that Hitler set up never sold a single civilian model before war broke out and switched to military models. After the war, the factory was restarted by the British and not continued by some Third Reich member.